...I gotta prolong this hiatus. Too much going on right now. Got a business that's starting to take off and the rest of the time I'm teaching sci-fi literature for a Humanities course at York University. But I am going to continue to hack away at Norm Walsh's blogware, which I decided was the right package for me. I will be back in April some time, after teaching ends and I have time to turn my intellect to something other than aliens and time travel. I am not stopping for good! The idea here is to integrate blogging into your productive life. The asweknowit project will always be an open-source research project. It's just being crowded out by sports stats and sci-fi right now. And if anyone can help me figure out how to get saxon to work via Walsh's Makefile, I'd greatly appreciate it. I need to switch blogware. I'm using very out-of-date software but it was, at the time, the only one which offered the kind of categorization I'm interested in. Now that Userland seems capable of incoporating topics I'm going to jump ship. This will take time away from posting to this blog. I may, however, write about my requirements and how they are, or are not, being met. Jonathan Druy has done it again. A great memorial web site for Neil Postman. A collection of eulogies, obits, etc. You'll remember I blogged his Ong site last summer. This has little to do with "the evolution of culture, technology and knowledge" but it happens to be the business I'm in. Introducing Statsology, "tracking innovations in sports data processing". Then again, when I get around to reading Moneyball this Christmas, I might be able to make the connection i.e. how are computing machines revolutionizing the sports world? That's good media ecology and fodder for this here blog. It's also a preoccupation with Statsology. Check it out. I should mention the good work Ian Glendinning is doing over at Psybertron. Not just because he's always blogging me but because we're working on similar problems from different approaches. Ian's one of the KM people (and an engineer with over 20 years' experience) whom it never occured to me would be interested in asweknowit. In my ignorance, I didn't realize how philosophical some KM types were. So if you want to know what Rorty and Nietzsche have to do with business knowledge, have a visit. If you like the problem raised in his manifesto--as I understand it: How can we better understand what we do given we never know precisely what it is we are doing--then have a visit. Check out my blogroll (finally back up after some kind of DNS snafu) for more KM with a philosophical bent from the likes of Dave Pollard and Ton Zijlstra. Although I was only there for the Saturday, I had a great time at NYSCA. Saw two panels apart from my own and attended the memorial for Neil Postman. For details on the people I mention and the titles of their talks, check the link provided to the NYSCA programme. Lance Strate gave a fun talk on the Tolkien panel comparing Tolkien to McLuhan. Both were Oxbridge-educated, colonial, Catholic converts with anti-modernist sentiments who were big in the '60s. The two shared a fascination with speech, grammar and language. Tolkien said "All my work is philological"; McLuhan's doctoral dissertation was on the history of the trivium (grammar, rhetoric and the dialectic) in Western education. Mcluhan took the side of the Grammarians and so, it seems, did Tolkien whose Treebeard says "My name is like a story". Next up was Susan Jacobson who demonstrated her Countless Stories production of testimonies from Tolkein fans. This is a non-linear story engine developed to accomodate open-ended narrative. You can see for yourself here. Type "treebeard" into the search engine for the Strate dope. Paul Levinson, who's been blogged more than once here, spoke after Susan. His "Confessions of a Science Fiction Chauvinist'" delved into the differences between sci-fi and fantasy. Although no fan of the latter, Levinson was taken by the Ring movies and suggested they might be science fiction after all. My last panel of the day was "Media: The Dark Side". Lily Alexander discussed notions of shame and transgression in the context of the public trials of celebrities like Gary Condit, Bill Clinton, O.J. Simpson, etc. She noted the historical link between shameful acts and drama. All those Greek plays--or at least the ones we know--are about vile behaviour. Paul Grosswiler spoke about student plagiarism and the Internet. It's been 36 years since McLuhan wrote: "Take any books on any subject and custom-make your own book by simply xeroxing a chapter from this one, a chapter from that one--instant steal!" (The Medium is the Massage) Grossweiler updated this analysis ("substitute 'downloading' for 'xeroxing'") and discussed and discussed McLuhanesque concepts like patchwriting. The Postman memorial left no doubt Postman was a great teacher who made a strong impression on the lives of his students. Many spoke at the memorial. Having met Neil only once, I didn't speak. But I thought afterwards that, being one of the few Canadians in attendance, I might have acknowledged how he helped keep McLuhan's legacy alive. The Media Ecology Association is a continuation of Postman's efforts to teach us that the medium matters. This is the title of a talk I gave at the annual convention of the New York State Communications Association last October 25. Nothing innovative, just a synthesis of state-of-the-art thinking on blogs. The idea was to give a sophisticated understanding of the blog world to smart but non-techie communications scholars. Abstract: Blogs cause a shift in the balance of power between writer and reader. Blog research and press coverage focuses too much on the supply side (writers), ignoring the two other main players in the blogosphere: readers and machines. The outlook for blogs depends as much upon innovation in reading tech (RSS aggregators) as in writing tech (blogware). Evolutionary trajectory of this medium is toward a relevance-switched content network. Current pre-occupation with "bloggers versus journalists" is an example of McLuhan's rear-view mirrorism. But misunderstanding new technologies is unavoidable, interesting and revealing. Following the common definition, thanks to Quick and Hiler: blogosphere is more than just blogs; it is the system or ecology within which blogs thrive. Can be understood as a system of relationships between writers, readers and machines. Too much research focuses on blog writers and not enough on readers and the technologies that facilitate contact between reader and writer. Most important technology in this regard is RSS. It's a protocol for creating a machine-readable version of a blo . Causes loss of control by writer over presentation. My own site has, unknown to me, been re-presented elsewhere. 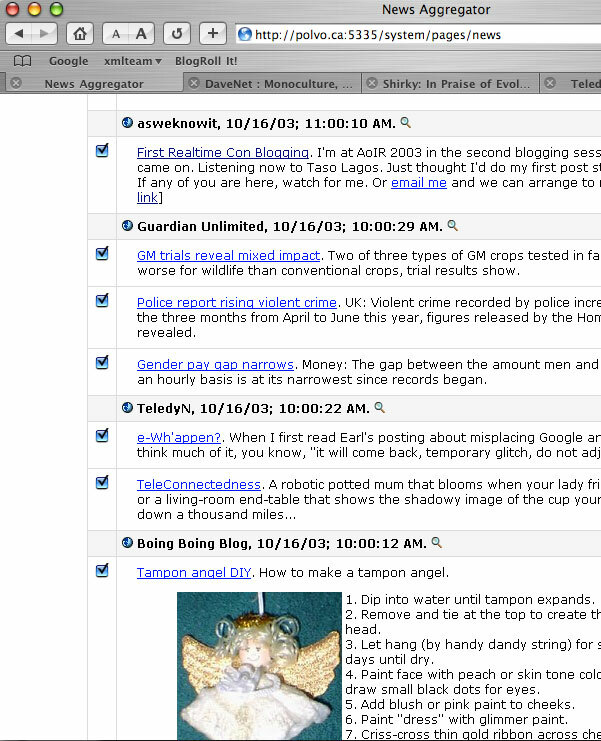 RSS readers aggregate summaries of blog content. In this context The Manchester Guardian and J. Random Blogger are on equal ground. Only difference is the Guardian has more subscribers. Bloggers should be promoting RSS readers as much as they promote blogging. Without RSS aggregators supply will exceed demand. RSS readers allocate attention resources more efficiently. You can track 618 sites in 34 minutes! You can defend yourself against the remotely-defined interface. The reader calls the shots. The reader's increase in autonomy is balanced by the writer's increased assurance of an audience. Ultimate goal is the relevance- switched content network. I don't care if more people subscribe to the Guardian than asweknowit. I just want to get to the right 50 people. If all that matters is writers finding readers, and readers finding stuff, then "blogs versus newspapers", and every other current controversy surrounding blogs, is a sideshow distraction. It's a sign of early- stage misunderstanding of a technology. But the hype and misunderstanding will persist. The blogosphere's creators are adept at the wishful metaphor, be it "memes", "neurons", or the alteration of "flows" (see #9). None of these are strictly true. Yet neither are they untrue, because technology is the embodiment of ideas and ideas guide the transformation of the material world. The blogosphere is a work in progress. We must learn to understand the role of hype, not condemn it. Hype is not always a bad thing and to prove it I will show you my favourite example of 14th c. Italian media hype. This is the poet Boccacio writing about the painter Giotto: "There is nothing which Giotto could not have portrayed in such a manner as to deceive the sense of sight." Here is a Giotto. Not too real, is it. But Boccacio only knew about what came before Giotto. He couldn't have known what was to come. Neither can we. We will continue to creatively misunderstand the medium. I'm at AoIR 2003 in the second blogging session. Wireless just came on. Listening now to Taso Lagos. Just thought I'd do my first post straight from a con. If any of you are here, watch for me. Or email me and we can arrange to meet. A long and very good memorial by Jay Rosen. I have no count, but I sense a dwindling number of people in the academic world who are unclassifiable. Neil Postman, who died Sunday, was one, and now we can say he will always be one. Such figures with reputation but no real discipline have a tendency to make people think. Postman had that. He was expert in nothing. Therefore nothing was off limits. Therefore ones mind was always at risk, from a joke, a headline, an idea, a person walking through the door. The only way to respond to such strange conditions was with ready humor. And humor would bring you more ideas. Now what discipline, what department is that? Another great media ecologist has died. We mourn the loss. He will be sorely missed. "Technological change is neither additive or subtractive. It is ecological. I mean "ecological" in the same sense as the word is used by environmental scientists. One significant change generates total change. If you remove the caterpillar from a given habitat, you are left not with the same environment minus caterpillars: you have a new environment, and you have reconstituted the conditions of survival. . . In the year 1500, fifty years after the printing press was invented, we did not have old Europe plus the printing press. We had a different Europe. After television, the United States was not America plus television; television gave a new coloration to every political campaign, to every home, to every school, to every church, to every industry. I had worked hard for nearly two years, for the sole purpose of infusing life into an inanimate body. For this I had deprived myself of rest and health. I had desired it with an ardour that far exceeded moderation; but now that I had finished, the beauty of the dream vanished, and breathless horror and disgust filled my heart. Frankenstein already knew the dangers of possession when he warned the would-be polar explorer Walton: "Unhappy man! Do you share my madness? Have you drank also of the intoxicating draught? Hear me, -- let me reveal my tale, and you will dash the cup from your lips!" And also: "Learn from me, if not by my precepts, at least by my example, how dangerous is the acquirement of knowledge, and how much happier that man is who believes his native town to be the world, than he who aspires to become greater than his nature will allow." "A human being in perfection ought always to preserve a calm and peaceful mind, and never to allow passion or a transitory desire to disturb his tranquillity. I do not think that the pursuit of knowledge is an exception to this rule. If the study to which you apply yourself has a tendency to weaken your affections, and to destroy your taste for those simple pleasures in which no alloy can possibly mix, then that study is certainly unlawful, that is to say, not befitting the human mind. If this rule were always observed; if no man allowed any pursuit whatsoever to interfere with the tranquillity of his domestic affections, Greece had not been enslaved; Caesar would have spared his country; America would have been discovered more gradually; and the empires of Mexico and Peru had not been destroyed." Yet the book also has a tendency to glorify the scientist-- "the modern prometheus" of the book's subtitle--as an anti-hero. He is like Milton's fascinating rebel Satan. There is also something inhuman about Dr. Frankenstein: his love of desolate landscapes, his lonely brooding. He is like Coleridge's poet in the last part of Kubla Khan--someone to be wary of, yet the Romantic hero through and through. The romantics were all for striving beyond the human and the book leaves it open whether or not the pursuit of knowledge is indeed compatible with a balanced mind. A cautionary tale? One obvious victim of Apollo is Oedipus, who gets done in after he does the sphinx in. Seeking knowledge of his origins as a young man, he is shunned by the Apollonian Oracle at Delphi. Later, in the part of the story taken up in Sophocles's drama, we see him single-mindedly, if deludedly, pursuing the answer. He does so with considerable skill, using the talents which served him in his confrontation with the sphinx. He mocks the blind soothsayer Teiresias and ignores his warnings. But wise Teiresias knows that it is Oedipus's own greatness that is his undoing. It is as if the original mystery of his birth has set in motion his considerable mental powers. She says, "Oh, as thou carest for thy life, give o'er this quest." "I cannot; I must probe this matter home," he answers. "Ah mayst thou ne'er discover who thou art!" His acumen is short-sighted but effective at uncovering truth. Always questioning, always pursuing some blinding hypothesis: that Creon is the guilty party, that the Shepherd will only reveal his low birth. Then the moment of truth and off he runs. When he returns the Chorus asks him what made him pluck his own eyes out: "Apollo! oh, my friends, the God, Apollo! Who worketh all my woes yes, all my woes." Oh boy, another series, just like "We Are Stupid For a Reason, Parts I-V". This one requires some explanation, however. For starters, we need to establish there is such a thing and that it is as powerful as the more familiar Dionysian possession. Apollo is, after all, the god of rational detachment, order, good government, etc. Possession suggests a frenzy that is anything but those things. The Apollonian frenzy, on the other hand, happens when one is taken by the vision of things woven together in abstract harmony. The promise of new powers and a new day beyond the present one, the attainment of which requires great sacrifice. That is Apollo's promise. Those possessed might be visionaries, so certain of the outcome of things, or those who monomaniacally pursue truth and knowledge or a political cause. The cases of Asclepius and Coronis mentioned above are instructive. Asclepius was an ancient Dr. Frankenstein who "had dared to bring a dead man back to life, so Zeus struck him with a thunderbolt. And, just that once, Apollo cried." (59) His mother Coronis preferred a mere mortal, Ischys, to Apollo. There are strong parallels between Ischys and Theseus, says Calasso. Theseus belongs to the age of heroes, of men acting like gods, adopting the strength of gods. "With the heroes, man takes his first step beyond the necessary: into the realm of risk, defiance, shrewdness, deceit, art." (70) Once he could detach himself from his environment, he could also detach from himself and conquer that self; he could ask for more. The monster the hero slays is the given, the old order which conspires against the possible. Apollo, who killed Python and took over the Delphic cult, was the first slayer of monsters, the first model for the heroes. The heroic impulse strives to clear some breathing room, to escape the old circumscriptions of fate. But it requires not only turning against the divine order but against ourselves: "It is part of the hero's civilizing work to suppress himself, because the hero is monstrous. Immediately after the monsters, die the heroes." (70) The hero dies because he is unable to appreciate that he is also doing battle with himself. Had he known that he probably would not have embarked on the adventure in the first place. The hero is therefore tragic, unable to know what he is doing until it is too late. Yet the hero is stupid for a reason, a good evolutionary reason: the hero builds culture. His sacrifice is good for us all. The Dionysian impulse dissolves the ego, alters the self to attain union with the other, or with nature. The Dionysian accepts the world as given, the Apollonian remakes the world. The Apollonian impulse adapts the world to man. But a new world means a new man of unknown fate. In both cases an alignment and dissolving of boundaries is sought. This blog is concerned with the Apollonian impulse because it is based on a fascinating paradox: the god of order and detachment is really the god of a different kind of intoxication. But Isn't the Hype Necessary? This one relates to recent comments from Jean-Luc Delatre. Harvard Business School prof. Henry Chesbrough makes the point that "the most valuable use of a technology by a customer or user is often very hard to foresee". He cites the VCR: originally intended for time-shifted viewing but no one foresaw the video rental market. Hollywood originally feared it but later adapted and profited. So the emotional responses to innovation of "fear" and "replacement" are based on a misconception: the idea that the likely impact of a technology is readily foreseen at the outset. The reality is that extensive experimentation and trial and error may have to occur before the best use of a new technology can be discovered. And the creator of the technology may not even know what this best use might be. This suggests that managers ought to downplay the hype about the enormous potential of a new technologyuntil some compelling uses begin to emerge - both to keep investor expectations down, and to reduce the possible consumer fear factor associated with that new technology. This sounds unrealistic. Will the primitive and over-priced early version of a technology ever attract interest without hype, without an emphasis on potential over actuality? Innovators are risk takers, how can we expect them to exercise caution in their claims for their gadgets? And lastly, isn't the demand for attention so high, and the supply so rare, that the only way to attract investors is through attention-grabbing hype? Innovation practically requires hype and there's a built-in inflationary tendency in the development of new technology. Compelling uses later emerge for the successful mistakes. But has any modest technology ever made it that far? One experiment of Gilbert's had students in a photography class at Harvard choose two favourite pictures from among those they had just taken and then relinquish one to the teacher. Some students were told their choices were permanent; others were told they could exchange their print after several days. As it turned out, those who had time to change their minds were less pleased with their decisions than those whose choices were irrevocable. This reminds me of Samuel Johnson's famous quote: "I believe marriages would in general be as happy, and often more so, if they were all made by the Lord Chancellor, upon a due consideration of characters and circumstances, without the parties having any choice in the matter." Found here. Choice does not necessarily lead to greater happiness. Happiness is a signal that our brains use to motivate us to do certain things. And in the same way that our eye adapts to different levels of illumination, we're designed to kind of go back to the happiness set point. Our brains are not trying to be happy. Our brains are trying to regulate us. Maybe our caricatures of the future--these over-inflated assessments of how good or bad things will be--maybe it's these illusory assessments that keep us moving in one direction over the other. Maybe we don't want a society of people who shrug and say, "It won't really make a difference." Maybe it's important for there to be carrots and sticks in the world, even if they are illusions. A curious story about a data network developed in Allende's Chile by Stafford Beer. To run an economy of newly nationalized industries the government needed lots of information, fast. Beer's network could achieve in a day what took months in the developed world. The article suggests the network was not biased toward centralized control and was meant to establish a socialistic peer relationship between bureaucrats and managers (it's uncertain where the workers came in to this). Apparently Pinochet's people had it destroyed, so radical was its design. As expected, the comparison is made to the Internet and its egalitarian bias even though Cybersyn, as it was called, hardly resembles the net at all. All told, a very interesting story but also a good example of the association of a communications network with far-left politics. I've therefore categorized this story in tech ideology, or perhaps I should start a separate category for Latin American dot- communism. Until now, obtaining and processing such valuable information - even in richer, more stable countries - had taken governments at least six months. But Project Cybersyn found ways round the technical obstacles. In a forgotten warehouse, 500 telex machines were discovered which had been bought by the previous Chilean government but left unused because nobody knew what to do with them. These were distributed to factories, and linked to two control rooms in Santiago. There a small staff gathered the economic statistics as they arrived, officially at five o'clock every afternoon, and boiled them down using a single precious computer into a briefing that was dropped off daily at La Moneda, the presidential palace. I recently had the honour of inclusion in a prestigious list of favourite Canadian blogs. The author of the list, Dave Pollard, has unleashed the interview game and I'm in for the usual reasons of fun and egotism. Besides, I never get personal here at asweknowit.ca. If you'd like to participate, see the rules at the bottom. Dave sent me the following questions and although my answers are short I laboured long over them. 1. What one thing do you most hope to be remembered for after you die? I think the best I can hope for is to have descendants who will acknowledge me as a link in the chain. The chances of being remembered for anything long after you are dead are pretty slim. But that's what motivates greatness, I suppose. 2. What do you think is the single greatest threat to the survival of the world today, and what do you think is the greatest hope? I do not believe there is any great threat to the survival of the world. I think alarms over "world survival" are part of an evolved mechanism which is well-calibrated to ensure our future. Most of these problems are knowledge problems. The things we now worry most about--say, global warming-- arose because we developed tools like computers to monitor ourselves. I believe global warming is preventable, but only if we get good and scared about it. So go ahead and sound the alarms. I think I've already answered the second part of your question. A lot of people think I'm cynical but I have a lot of faith in humanity. 3. What single life lesson do you think is most important for young people to learn? George Kennan once complained about "the curses of egotism, romanticism, day-dreaming, introspection, and perplexity which befall the youth of bourgeois countries." Breaking out of that fantasy realm of the self is probably the most important step toward maturity. 4. Of all the people alive today, who do you think would make the best Prime Minister of Canada? Why? 5. If you had a million dollars, what would you spend it on? A school for people who are truly interested in learning, not in advancing their career or seeking shelter from the real world. It would be modelled on Black Mountain College. 1. Leave me an email, saying you want to be interviewed. 4. You'll include this explanation, and acknowledge me as the interviewer. asweknowit.ca is about the relationship between technology and knowledge. We are what we know. Mind-Culture Coevolution: Major Transitions in the Development of Human Culture and Society. A collection of writings by William L. Benzon & David G. Hays.